The file called wp-config.php is the main configuration file for any WordPress website. 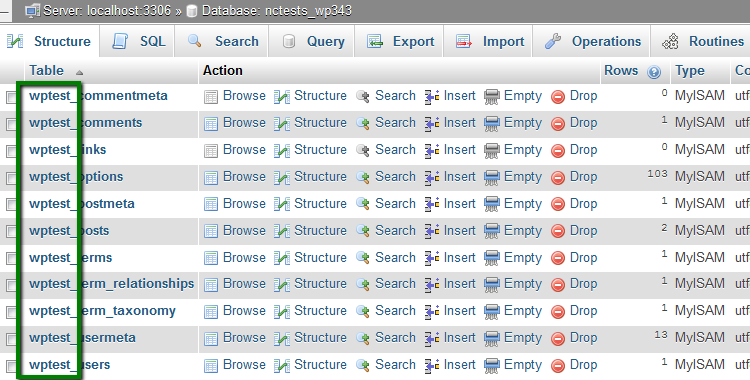 It’s always located in the root folder of the domain’s WordPress installation. Unlike other basic WordPress files, it's generated specifically for your website during the installation. It keeps information about the database for your website and some other essential settings. As it contains important information, we do not recommend editing it without making a backup of the file or even the website. 2. Download the file to your device and use any text editor, like Notepad or TextEdit, to make the changes. Once done, you will need to reupload the file to the hosting account. Before we get to the actual editing of the file, let’s take a look at the basic wp-config.php file code. Let’s take a look at each section. 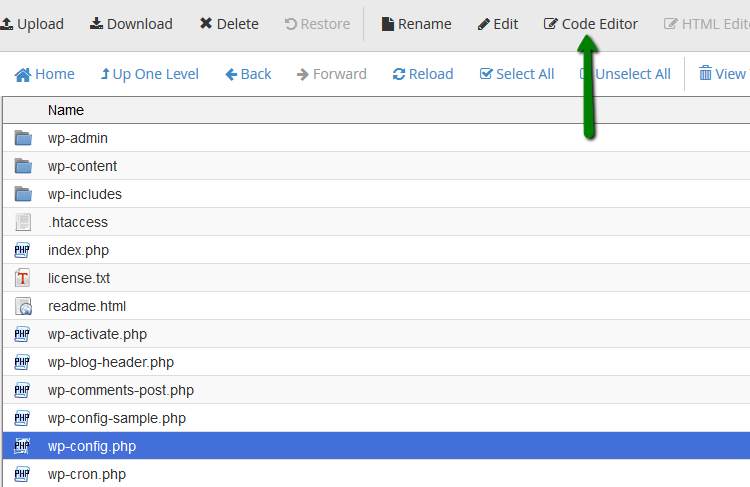 If you are installing WordPress using Softaculous Script Installer, these settings are filled in automatically without a need to make any changes from your side. DB_HOST – you need to use exactly 'localhost' or '127.0.0.1'. Unique Authentication Keys and Salts help to improve the security of your WordPress website. They provide strong encryption for user sessions and cookies generated by WordPress. /**#@+ * Authentication Unique Keys and Salts. You can generate new keys by visiting this link https://api.wordpress.org/secret-key/1.1/salt/. 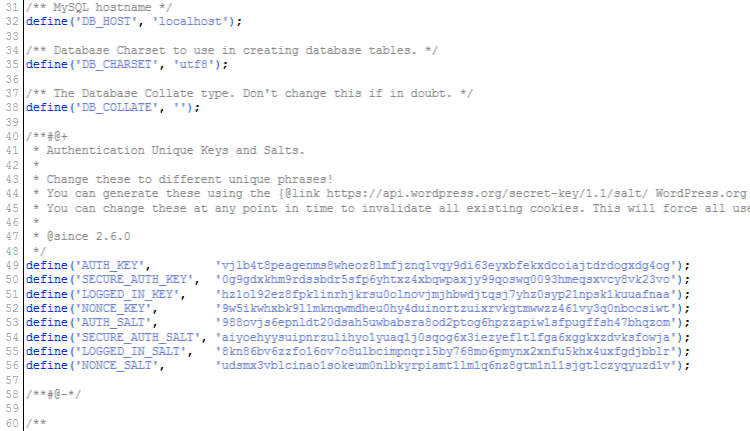 Just copy and paste keys to the wp-config.php file. 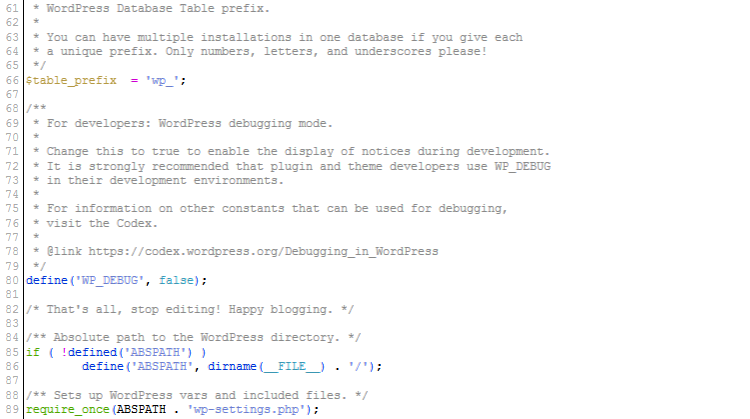 Updating these keys is rather important if you suspect your WordPress installation was hacked. Changing authentication keys will log out all authorized users from the system and make them log in once again. It’s recommended changing this prefix to a custom one for security reasons. This can prevent hacker attacks to your website as it protects (prevents is used two times in the same sentence) from guessing your WordPress table names. It’s quite easy to change the prefix while installing WordPress. However, it will require several steps from you in order to make the changes for existing websites. 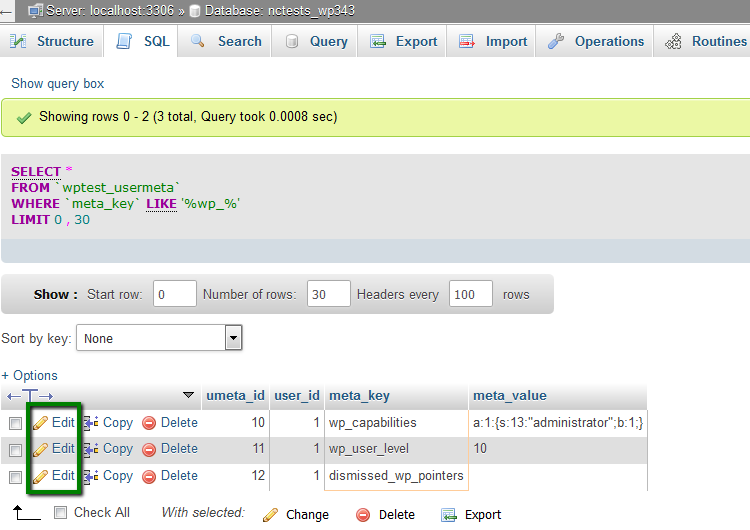 NOTE: newprefix_ should be replaced with the new database prefix you wish to have instead of wp_. The number of entries may vary depending on how many plugins you are using and such. Here you need to change everything with wp_ to the new prefix as well. 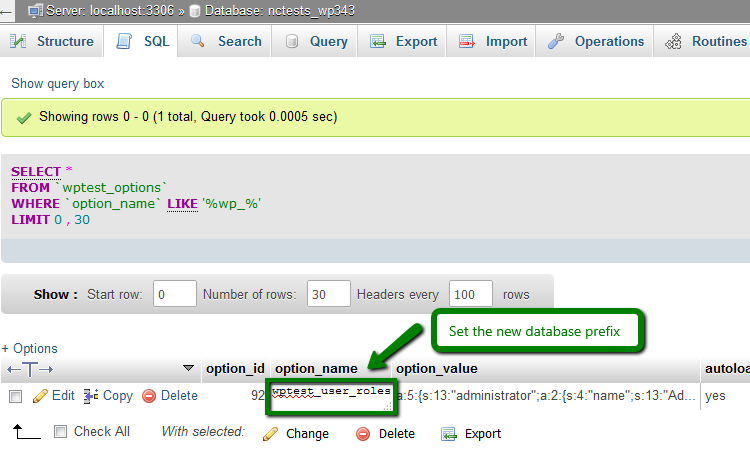 Also, you can change the database prefix using special plugins like Change DB prefix or Change table prefix. This feature can be useful for users, that are learning WordPress development or trying to use some experimental functions and options. 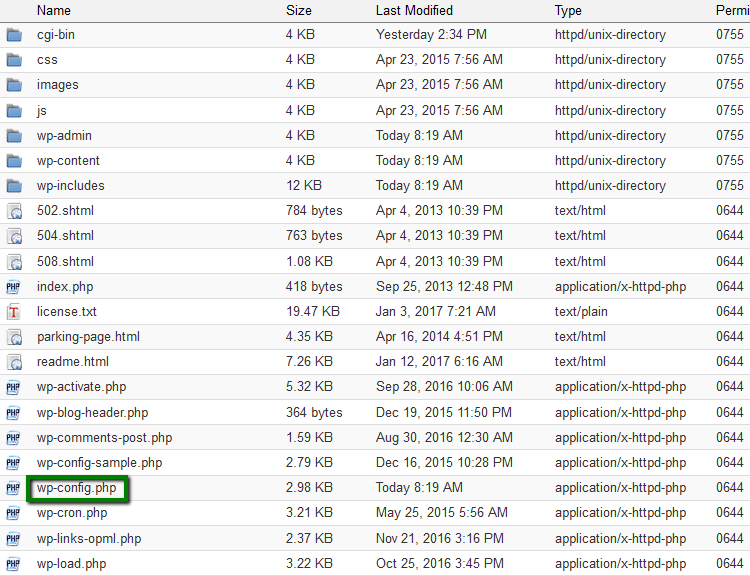 By default WordPress hides notifications, which are generated by PHP during code execution. If you change the following line from false to true, WordPress will show all PHP notifications. In this example, you can see port 5067. However, it can be changed according to the settings you need to apply. So do not forget to make the necessary changes. The exact changes must checked with your hosting provider. Sometimes it is required to change WordPress URLs. For example, you have changed the domain of web hosting service. You can apply the change in a WordPress admin dashboard or a database assigned to the website. 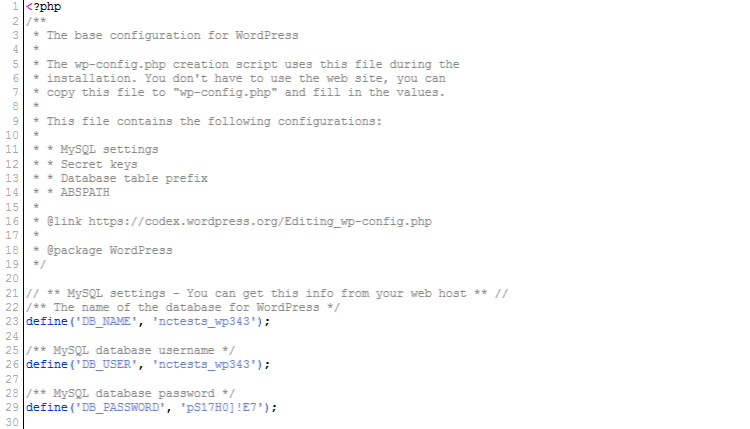 However, you can also make these changes via the wp-config.php file. This can be quite useful, when you can’t access your WordPress admin dashboard. Do not forget to change 'http://example.com' to your real website's domain, which can also contain https or www. 'newfolder' can be changed to any folder name you are going to store the files in. Number '3' should be changed to number of revisions you would like to store. Limit '64M' in this example can be changed to the limit you need.